It is hard to believe that Freddy Adu – seemingly a "name from the past" – is still only 22. After all, he became a phenomenon in the football world almost a decade ago, attracting interest from top clubs in Europe even before making his debut for MLS side DC United as a 14-year-old in 2004. Big things were expected, the bar was set mind-boggling high – but Adu has never looked like living up to the billing. Despite playing in DC United’s MLS Cup-winning team in his first season, Adu spent just three seasons in the American capital before being traded to Real Salt Lake, where he spent one year, then sold to Benfica for close to £1.3M. By now, question marks were already appearing over whether Adu would develop into the player that many had predicted – and struggles in Europe provided his critics with more ammunition. Several loan spells, including stops at AS Monaco and Belenenses, brought disappointing results, prompting Adu to draw a line under his European adventure and accept an offer to return to the MLS with Philadelphia Union. His form for Philadelphia has been erratic, but signs of improvement are emerging and his versatility across a range of attacking positions is an asset. However, he remains a work in progress. As former Union manager Peter Nowak explained: "There are a lot of things he can bring to the table but he needs to be focused and involved in the play. It is not just about the skill level he has, it is also about working for the team concept." The Union began the 2012 season in woeful fashion and, despite four wins from their last five MLS fixtures, sit ninth in the ten-team Eastern Conference. Inside Futbol (IF): On a personal and team level, how do you feel the season is going? 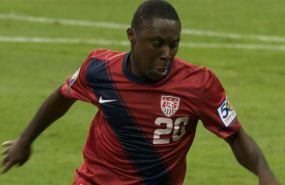 Freddy Adu (FA): Personally, things are getting better and better for me. But that really doesn’t mean anything – it’s all about the team. It’s not going exactly to how we want it to go but we’ve just got to keep working hard and when the bounces start going our way, hopefully we can take advantage. IF: Over the years since you burst onto the scene, how has the spotlight shifted? FA: It is what it is really. When you come in as a 14-year-old, everyone’s asking stuff and going crazy. There was pressure but I was young enough that it was just fun for me. But at the end of the day, I’m 22 now and I’ve been in the league for a while – and you have to start producing on the pitch. I’ve started to have more of an impact in games and that only happens when you’re playing games, not sitting on the bench then playing one game then sitting on the bench again. You can’t get a rhythm like that. IF: Starting out as a 14-year-old, how did that turn your world upside down? Was it easy to stay grounded? FA: I kept the same friends, but there were still a lot of things for me to get used to initially. There were a lot of things that I obviously didn’t handle well, but I learnt from them, I grew up and now I’m making the right decisions. IF: How was your time in Europe? FA: It was nice. The first year in Europe was great but everything kind of went downhill from there. I wasn’t playing as much as I would have liked. I decided at that point that it was time to get some stability, come back to the MLS and play and get better. Playing games is the key – you’re going to develop as a young player if you’re playing week in, week out. IF: As you look further ahead, are there goals that jump out for the future? FA: Sure, there are. But right now I’ve got to focus on the present and put in the work to get better.